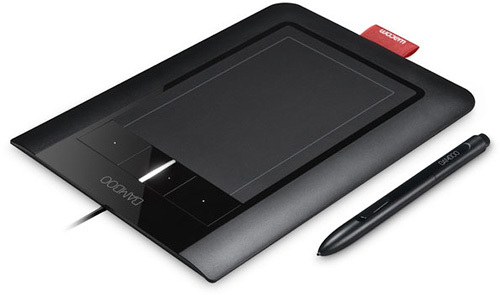 Wacom Bamboo Pen & Touch | OhGizmo! The surprise was kind of spoiled last week when someone actually managed to buy one, but today Wacom officially unveiled their new multi-touch friendly Bamboo tablets. They essentially work like a larger version of the MacBook’s already large touchpad, allowing you to use your fingers for multi-touch gestures, as well as the traditional Wacom stylus for drawing and other more precise work. And while it seems a bit confusing, there are actually now five different products in Wacom’s Bamboo line which each contain different levels of multi-touch vs. stylus functionality at varying price points. At the low-end there’s the Bamboo Touch and the Bamboo Pen which only support multi-touch or the stylus for $69, and on the high-end there’s the Bamboo Fun for $199 which supports all of the aforementioned features and appears to be slightly larger, and only available in silver/grey. http://www.facebook.com/Wacom – Wacom also redesigned their Facebook Page to highlight the new Bamboo Touch line. If you'd like to talk with other Wacom owners about the tablet, or just see what they're creating, check it out!